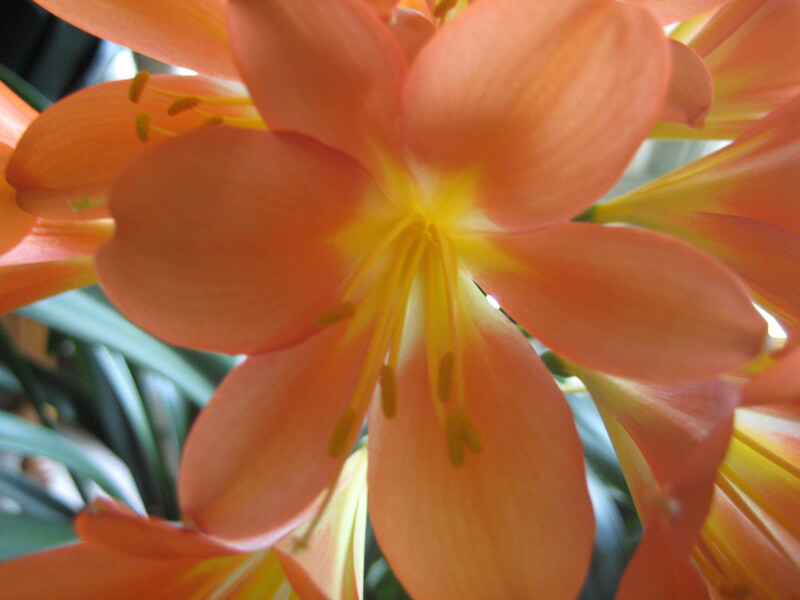 A benefit of leaving our home during winter: my clivia now blooms in the spring, right in time to greet me when I return home. In the past, it bloomed during summer months while we were sailing the Great Lakes. I think its change of routine has a lot to do with our house going into a cold slumber while we’re away in the winter months. My houseplants are able to experience a change of seasons, and they’ve never done better. They seem to enjoy going dormant during Michigan’s cold and dark winter months. And what a delight it is to return home to this plant, just ready to break out in bloom and remind me of the family I’ve missed while away. My grandmother was a gardener. She had beautiful flower gardens; Mother’s Day as a child meant picking bouquets of lily of the valley which grew in abundance on the edges of her yard. (My yard currently is fragrant with lily of the valley, and I can’t help but think of my grandmother each time I walk out my front door.) She died in 1992, just 4 months short of her 100th birthday. 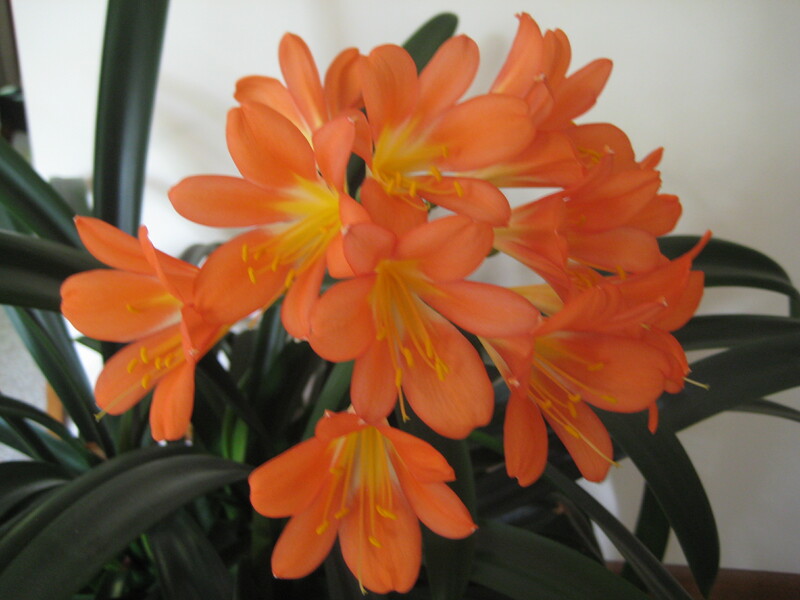 The clivia plant that graces my home had been hers, showing up in the background of the occasional photo from my childhood. It is a very old plant! It was “taken in” by an aunt and uncle when my grandmother sold and moved from her home. Who knew a plant like this could outlive its owner? I inherited the plant when my aunt and uncle moved into a retirement facility. Every few years I take the plant out to the backyard, dump it out of its pot, and whack away at its roots, separating the plant into “starters” for other members of the Schneider family. To date, there must be at least 15 clivias growing out there, all “babies” of this original member. It feels good knowing that memories of our grandmother and great-grandmother’s life live on and thrive in this plant, bringing beauty to many, many homes. Joie, I don’t know what “PM” is. Can I tell you here that I would love a piece of this? I will find a cool place for it in the winter and treat it like the sweet, precious child that is. Mike and I will be in Michigan in July (on Cudjoe Key next week). Sometime, some where, somehow… I could share it with Louise and Larry! They both have Grandma’s green thumb – as does my son Matthew! Yes! I must have some!!! “PM” is just “private message” me… I will email you. Yes, I’ll make sure that you get a piece when we’re here. And say “hi” to the Keys for us. It should be really hot down there by now, judging by all the heat in February!